And on one hand, I have to say, they have a bit of a point. There are a lot of great resources out there, including online travel guides (hey, like a lot of you, I TripAdvisor and even Yelp on occasion), and even just Google itself. And the world of travel blogs (including food blogs, like, well, this one) offers a lot of really great first-hand descriptions of destinations and activities. And Airbnb has proven to be a Godsend to the traveler to areas with hotel shortages (indeed, half of my Faroe Islands stay was airbnb). As a particularly good example, my friend Shane pretty much planned his entire trip that way (his travelog is a good read). And especially now that a substantial number of destinations also have good cell data coverage, the era of the smart phone brings most of these resources right to your fingertips, so even the maps aren’t as useful as they used to be. Heck, I’ll even agree that not all travel guides are all that great, either. Sometimes, they are dated, especially for some of the more obscure destinations. 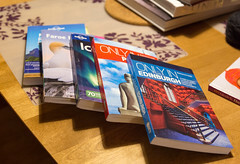 Sometimes, they are woefully inadequate in detail (a good example of this is the Lonely Planet’s Faroe Island coverage, which is, literally, just a few paragraphs in the back of the Iceland guide). Helpful supplements to other resources, in that they provide additional resources, depth, and other insight beyond what’s easily available. Detailed maps. Well-planned itineraries. Useful advice beyond price about good places to stay and dine. And some nice educational background about the area, customs, and culture. Good examples of this from my own travels include the Bradt Guides and Duncan J D Smith’s “Only In” Travel Guides, which have been thoroughly researched by their authors. A useful curation resource. There are some cities like Paris and London that have a truly bewildering list of attractions, and any sort of guide that’s simply providing itineraries, lists, or rankings can often be as much of a hindrance as a help. A really good guide will be curated: providing a meaningful, easy to explore subset of the destination, and treating it in enough detail that you come away fully appreciating the series. Again, a good example of this is the above-mentioned “Only In” guides. The ones that I’ve had a chance to read (Paris and Edinburgh) both offer a splendid list of attractions both common (like “Edinburgh Castle”, calling attention to some of the easier-to-pmiss details), obscure (he’s got an entire multi-page description of an old railroad tunnel come pedestrian route), and whimsical (discussions of a gin distillery that used to be small animal hospital). While this sort of detail can be found on the internet (indeed, it’s what I strive for here), it’s really good when a thoughtful author has collected it in one place. A critical resource. And if you really are the adventurer such as myself, you’ll eventually run into the destinations that due to either obscurity or language differences, just really aren’t well documented on the internet. For example, when I was traveling to the Isle of Réunion, I quickly learned that the vast majority of tourists are coming from mainland France, and the online resources are thus primarily in French (indeed, as I still look up recipes from the Island, Google Translate remains one of my standard tools). But the Lonely Planet did a good job here: while most purveyors of travel guides overlook the island, Lonely Planet does a reasonably good job with their combined guide to Réunion, Mauritius, and the Seychelles (although I did not in passing that the French version of the Réunion guide is obviously more detailed, since it was almost twice as thick!). Similarly, if you are an English language speaker looking for tourism information about the Faroe Islands (aside from their rather nicely done official website), you’re best off getting the Bradt Guide, since, well, it’s pretty much the only English guide to the Faroes (and rather well researched at that). So, while my frequent use of travel guides may also be labeling me as an anachronism, or possibly even a Luddite, I’m still quite the fan of a good travel guide, and more than willing to invest in a good one. I’ve mentioned my guides…. what are your favorites? Every spring, I go with the local high school FIRST Robotics team down to compete at Manchester, New Hampshire, for three or four days. Usually this means that I have a few hours to explore the local food scene a bit more. In the past, that’s pretty much the way I discovered the Red Arrow Diner, Greg’s Place, Golden Bowl, and Gauchos Churrascaria. (And I should actually write up all of these, too.) This time, I made a concerted effort to find someplace good for breakfast that was off the beaten track. A quick web search lead me to Belmont Hall, at the corner of Grove and Belmont SE of the Verizon Arena.